Detailed study of the structure and behaviour of chromosomes in the somatic tissue of twenty-one species of the genusDracaena has been made and the “normal” chromosome numbers of all these species have been reported for the first time in this paper. The previous and the present records suggest that most of the species possess a number of chromosomal biotypes. These biotypes mainly differ with respect to their chromosome numbers. Relationship between species showing multiples of different series of chromosome numbers, viz. eight, ten, thirteen, seventeen and nineteen has been indicated. On the basis of the fact that a general resemblance in gross morphology of chromosomes and similarity in total amount of chromatin length are present amongst different species of the genusDracaena, it has been suggested that the species of this genus represent a homogeneous assemblage in spite of the fact that inconstancy in chromosome number is noted within a species. The different lines have mainly been assumed to have come out through continued production of aneuploid numbers during evolution. The presence of a number of chromosomal biotypes indicates that such aneuploid numbers often arise. Minor differences in details of chromosome morphology, and the presence of super-numerary constrictions in certain species, have been regarded as proving that structural changes of chromosomes have also played a distinct role in evolution of the species. As the different species ofDracaena are propagated exclusively through vegetative means, the only explanation for the origin of biotypes which can be suggested is that the recorded variant nuclei enter into the formation of new daughter shoots from which new individuals originate with different genomic constitutions. As flowers are scarcely noted and sexual reproduction is entirely ineffective with respect to propagation, this seems to be the only way through which speciation is effected here. The present investigations on the chromosome study of ten Indian representatives ofViola have revealed interesting data from cytotaxonomical and cytoecological standpoints. The existence of two distinctly different chromosome series in the same species, rather uncommon for this genus, has been recorded inV.serpens (2n= 18 and 48) andV. biflora (2n = 12 and 20). Such intraspecific variations imply that differences in numerical series of chromosomes should not necessarily play an important role in categorizing species assemblages. They have also been noted inV. tricolor (2n = 42 and 46) and polyploid cytotypes have been recorded inV. hookeri (n = 9 and 36). On the basis of chromosome data, it has been stated that the retention ofV. odorata andV. tricolor under the section Erpetion as followed by Engler and Prantl, is not desirable. De Candolle in his system kept the two genera under two separate sections. Remarkable similarity betweenV. serpens ( 2n = 18 and 48) andV. distans ( 2n = 44) in chromosome morphology has been shown. From a study of the chromosomes of different ecotypes it has been shown that inViola extreme climatic conditions are tolerated by diploids, whereas the polyploids abound in comparatively moderate climate, which is rather uncommon for other genera. The objective of this study was to assess the genetic diversity of the Sirohi goat for DRB and DQB1 loci, and to study their association with antibody response induced by the Peste des petits ruminants (PPR) vaccine. A total of 360 Sirohi kids were studied using single stranded confirmation polymorphism (SSCP) followed by polymerase chain reaction sequence-based typing (PCR-SBT) for DRB and DQB1 diversities. The competitive enzyme-linked immuno-sorbent assay (C-ELISA) was used to evaluate immune response post-PPR vaccination. Study revealed rich diversity of major histocompatibility complex (MHC) region in goat. A total of 18 DRB and 15 DQB1 alleles were obtained which were new. Alleles DRB*0104 and DQB1*0101 were the most common. The approach of SSCP combined with PCR-SBT reflects cost-effective and most powerful approach to decipher the genetic diversity in complex MHC region. 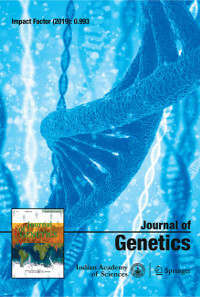 Study revealed variation in DRB and DQB1 genes in Sirohi flock along with high Wu–Kabat index. A totalof 16 of the 89 amino acid residue sites in DRB and 19 of 86 residue sites in DQB1 had more than three amino acid substitutions. Positive evolutionary selection was evident in Sirohi forMHC region. Nonsignificant association of DRB and DQB1 genotypes with PPR virus (PPRV) vaccine response revealed complexity of the phenotype and importance of other factors for vaccine response. Rich diversity of DRB and DQB1 genes reflects the fitness of the population and importance of this locus for future selection programmes. Nonalcoholic fatty liver disease (NAFLD) is characterized by the accumulation of fat in the liver without any history of chronic alcohol consumption. It encompasses a wide spectrum of diseases that range from simple steatosis to nonalcoholicsteatohepatitis. NAFLD is strongly associated with obesity, insulin resistance / type-2 diabetes mellitus and the metabolic syndrome. NAFLD is a complex disorder; environmental and genetic factors interact with NAFLD manifestation and determine its progression. In this review, an attempt was made to provide current information on the genetic variants of NAFLD in Asian populations. Literature search was performed by using PubMed, Medline and Google Scholar database. Candidate gene, validation and genomewide association studies (GWASs) were included in this review. A total of 41 studies fulfilled inclusion criteria of which 12 candidate gene studies exclusively focussed on the PNPLA3 gene and 17 other studies on other important candidate genes such as NCANCILP2, PPARG,AGTR1, FABP1, APOC3 etc. reported significant association with NAFLD. Eight validation studies identified associations of variants on PNPLA3, LYPLAL1, TM6SF2, ADIPOR2, STAT3, GCKR, SAMM50 etc. with NAFLD. Thus, so far, four GWASs have been conducted in Asian population that reported PNPLA3, SAMM50, PARVB and GATAD2A genes which were significantly associated with NAFLD. Findings indicate that PNPLA3, APOC3, PPARG, NCAN and GCKR genes emerge out to be the important biological markers associated with NAFLD.